I’m no stranger to life’s dark moods, to anxious thoughts, doubts, fears and unmet expectations. I’m no more or less human than anyone else. But I believe in pleasure too and love and the beauty of small things. Like watching a bee burrow itself into a flower, drinking the sweet nectar only to happily make its way out and buzz about to the next one. Small, beautiful, unnoticed. Then there is the artichoke, maybe not necessarily small, but beautiful and previously unnoticed by my eyes. In my far too frequent trips to the market, I never stopped to pay much attention to it. I found it intimidating; those pointy leaves, a little closed off - perhaps a defense mechanism? After all, the goal is to just get to the very best part - the heart and the only way to do that is to peel layer after rough layer. But one day, while making my typical rounds I suddenly stopped short when spotting the artichoke bin. I had one thought and one thought only. I want to photograph it! I never thought beyond that, like maybe I’d actually eat it? And like it…a lot? I returned home, dropped my shopping and got to work. Nothing else mattered, just the beautiful artichokes. 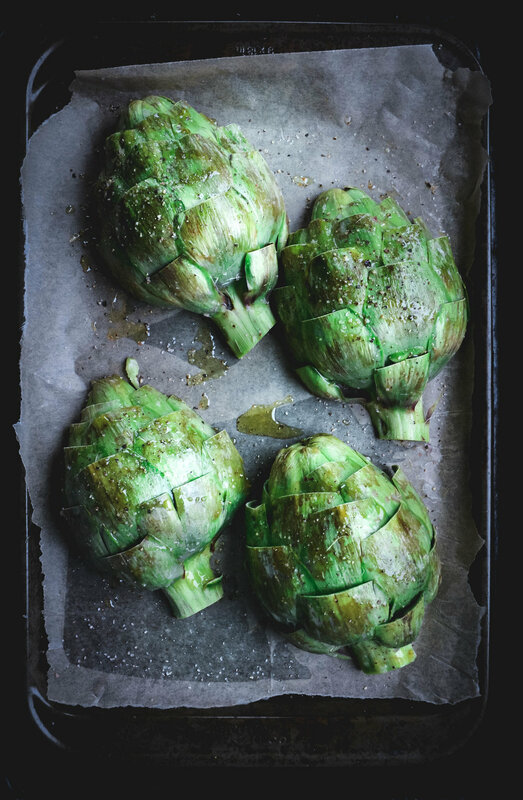 And so it began; one thing led to another and then next thing I know, I’m siting at my kitchen counter with a plate of artichokes, about to eat them for the first time. So I sat, mesmerized and sucked into the moment, enjoying bite after bite, slowly, meditatively even, dipping, and biting, dipping and biting until I got to the very best part, the essence of the choke. As for the dip, since mayo and aioli are staples in my house, it wasn’t a difficult decision. And a simple lemony aioli was the ideal companion for these mysterious, divine leaves. I’ve eaten many things in my life, but I don’t believe anything has brought me quite as much pleasure as photographing, preparing and eating an artichoke has. A true delight for the senses, a celebration of life’s small pleasures all in one small, green, rough and yet so delicate vegetable. Trim artichoke leaves by snipping just the tops with scissors. Cut stem and leave about 1-2”. 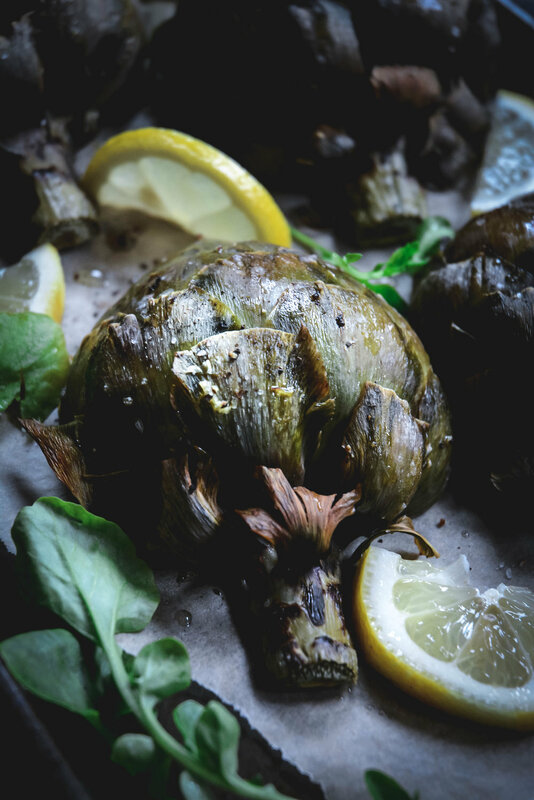 Cut artichokes in half and rub with lemon half and squeeze juice all over the artichoke halves. Sprinkle both sides with salt and pepper and drizzle with olive oil. Lay artichokes face down on parchment paper lined roasting sheet and roast for 35-40 minutes until tender. Meanwhile, combine mayo, mustard, pinch of salt, garlic, lemon zest and lemon juice in small mixing bowl and stir well to combine. When artichokes have finished cooking, remove one leaf at a time and dip bottoms in aioli and enjoy! The window was slightly ajar letting out some of the steam that had built up in the small kitchen. My grandmother feverishly stirring what looked like an absurdly large pot while chattering about the neighbors. I sat at the kitchen table staring out the 7th story window, daydreaming and patiently waiting with my piece of fresh, crusty bread. Six minutes is a long time for a kid. I turned back to the scene behind me. My grandfather’s towel wrapped hand, swiftly maneuvering past my grandma with the boiling pot; some sort of bickering exchanged. Cold water running, I waited; stomach growling. I knew the routine. It was predictable, timed and always perfect. As he cracked the top open, I could see the orange glow against the white. It was a magical sight. A pinch of salt, a dash of pepper. A beautifully cooked soft boiled egg. It was the perfect egg for dipping my bread in it first, then scooping out the white with the spoon. A few pieces of hard, aged salami, tea and breakfast was complete. Something as simple as eating an egg, when done slowly, with intention, can become nearly ceremonious. There was an utter delight in having this carefully cooked egg before me that took just minutes to make. I’m not certain I appreciated it as a 7 year old, but the memory is deeply ingrained and I look back on it with fondness. I hesitated writing this blog post because it seemed a little silly at first…everyone knows how to cook a soft boiled egg, right? But after posting an image on my Instagram feed about cooking the perfect soft boiled egg and receiving questions about the technique, I thought maybe not. So a single egg is getting its own blog post. After all, the egg is a coveted food around these parts. So let’s jump right in to the method of cooking the perfect soft boiled egg. Add 4 cups water to small pot. Bring to a boil. Reduce heat to a simmer and gently place eggs in water without bouncing them. Return heat to boil, cover with lid and set your timer for 6 minutes. After 6 minutes, dump out water and run eggs under cold water for 1 minute. *Bonus: To cook a perfect hard boiled egg, follow the same steps for boiling water, reducing heat but just add eggs and boil with lid on for 13 minutes. Rinse under cold water for 1 minute and peel. Have you ever had gochugaru? I hadn’t until recently and it was eye opening. I feel, while I try my best to eat and cook a variety of food, I inevitably get stuck in my ways and in my food bubble. I know what I like and I generally play around within my comfort zone without much sway. But when Jean Choi, the author of Korean Paleo asked if I would review her new book, I was honored and excited to cook outside my safe space. While there are numerous recipes I will be making, I wanted to try something that I felt was a bit intriguing. A recipe with only a few ingredients but one in particular that I had never been exposed to before - gochugaru. I didn’t know what to expect. While a zucchini pancake seems fairly straight forward, it is utterly transformed the moment it touches the sweet and sour dipping sauce. For me it was a moment of awe. After the first bite, I had to stop and take in the experience - it was new, unfamiliar and intriguing. 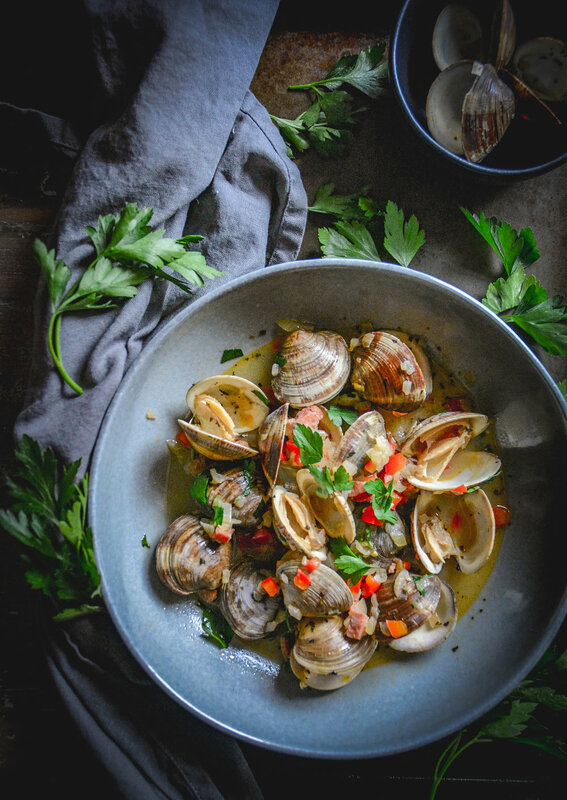 A simple sauce can elevate a food to new heights and in the moment, I knew, I was going to love the rest of the book as much as this recipe. Unless you have a specialty or Korean market in your area, I recommend purchasing gochugaru on Amazon as well as the cassava flour, which isn’t commonly found in your standard stores. So let’s talk about the pancakes. You’ll need zucchini, cassava flour, egg and sea salt. Few ingredients but they create a crispy, light, savory pancake that melts in your mouth. And I hope you will experience the same moment of intrigue as I did the moment you dip a delicious hot zucchini pancake in the sweet and sour sauce. 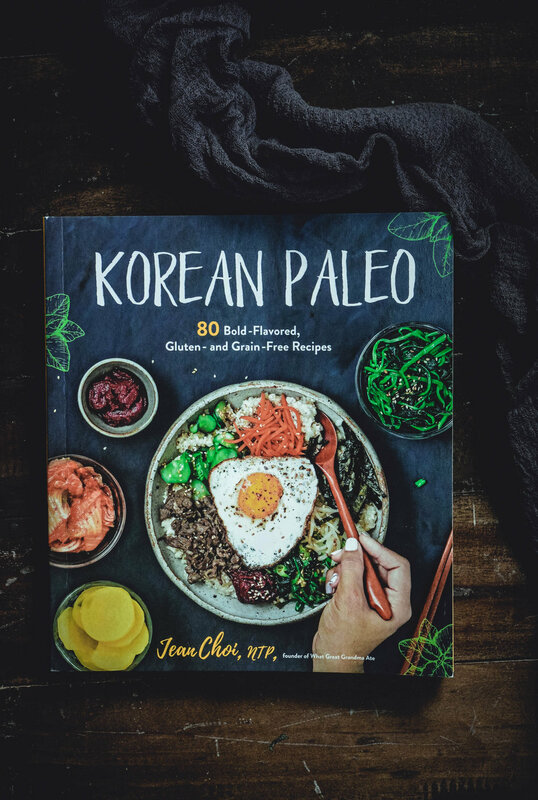 So be sure to check out Jean’s Korean Paleo cookbook and get your hands on incredible, flavorful recipes! Combine all ingredients for sweet and sour dipping sauce and set aside. Toss the julienned zucchini with the sea salt in a bowl. Let it sit for 15-20 minutes. Use a cheesecloth or a nut milk bag to squeeze out as much liquid as you can from the zucchini, and reserve and set aside the liquid. Place the zucchini in a mixing bowl and add the cassava flour, egg and 1/2 cup of zucchini liquid. Mix with a fork. If the batter seems too thick, add more zucchini liquid. (1 tablespoon at a time) until it reaches the consistency of pancake batter. If you run out of liquid, use plain water. Heat your choice of cooking oil in a large skillet over medium-high heat. Wait 5 minutes until the pan gets very hot. Add the entire batter if you want to make 1 large pancake, or you can add a few tablespoons at a time to make smaller pancakes. Let it cook for 1 minute and then reduce heat to medium and cook for an additional 1-2 minutes until browned and crispy on the bottom. flip and cook the other side for 2 minutes adding more oil if needed. Serve immediately with a side of sweet and sour dipping sauce. You can cut the pancakes in smaller pieces or rip them apart as you eat. It was early. A strip of red visible on the horizon. I made my way out the door with anything I could throw on. I didn’t want to miss it. Out of breath and still trying to shake off the nights’ sleep, the ground beneath shifted from pavement to a soft crunching. Transfixed, I stood watching the subtle shift in clouds as they gave way to the morning sun. There’s nothing like a beach sunrise. A winter beach sunrise to be exact. I did a 360 sweep and noticed I was the only one on the beach. I sat in the sand oblivious to the cold, lost in the rhythmic lapping of waves. The beauty of this place bewitches me, leaves me tormented and euphoric every time. I wanted to take it in as much as I could in the short time available. Emotions flowed though me ranging from elation to melancholy, knowing that in just a few short hours, I’ll have nothing more than videos and photos of this place. I tried shaking off the woeful feeling and started walking. Naturally the thing that comes up most in my repertoire of thoughts, is food. Last night’s food. In particular the chorizo and little neck clams appetizer that left me wanting more. It was one of the best I’ve had in a long time. One of the obsessive things I do when going out to eat is try and figure out how the chef made a certain dish. What’s the key ingredient? What makes it stand out? I decided to seek validation…I wanted to know; was it dry basil? When the waitress returned nodding cheerfully, I nearly exploded with excitement. Perhaps it was the two glasses of wine that made me chattier than normal, but I had an entire discussion with her about basil. 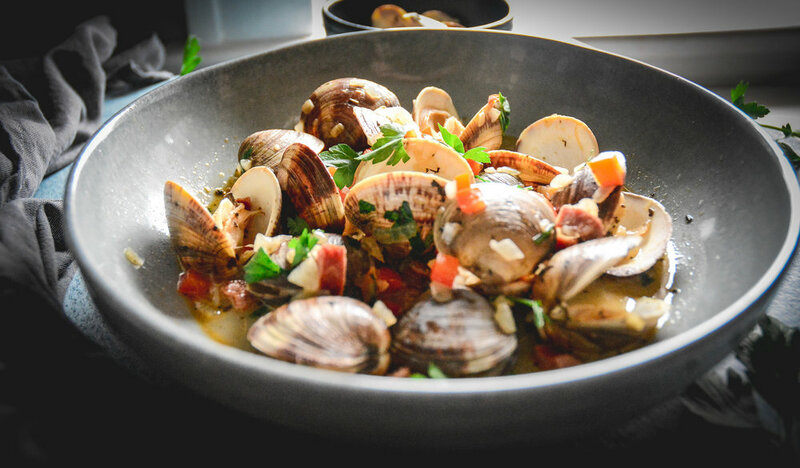 My husband half embarrassed, took advantage of my being deep in conversation to polish off the last of the chorizo and little neck clams. So there I was, frozen on the beach and hardly realizing it, about a mile from the hotel, thinking about chorizo with little neck clams. The only good thing about leaving would be getting to recipe test this thing at home. I was excited about its simplicity and rich taste. I was amazed at just how effortless this recipe is. The chorizo is already cooked and in roughly 15-20 minutes you'll have a perfect appetizer. If you want to make a meal out of it, serve it over zucchini or rice noodles. Preheat dutch oven. Add olive oil, onion, red pepper and salt and cook on medium heat for 8 minutes until onion is slightly caramelized and pepper is soft. Add garlic and cook for 30 seconds. Next, add dried basil, chorizo and and cook for 2 minutes. 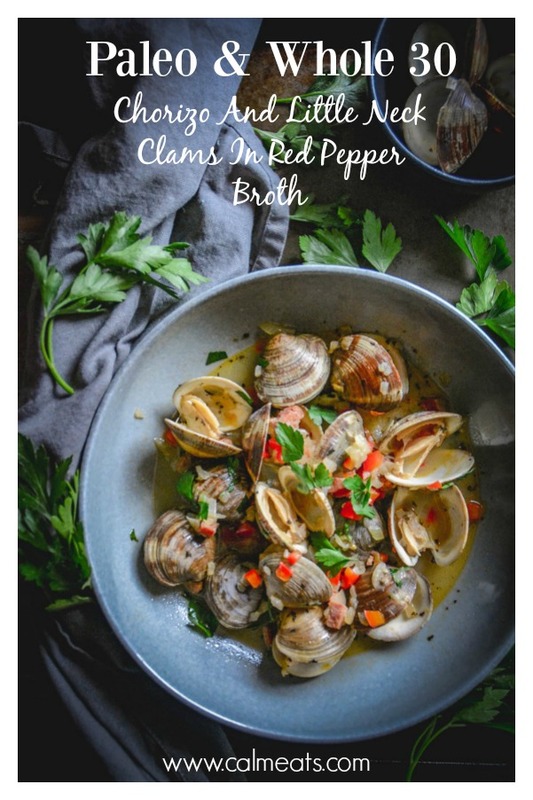 Add wine, increase heat to high and add clams. Cover and cook on high heat for 7-8 minutes. Do not open the lid during this time. Once cooked, discard any clams that haven't opened. Sprinkle with fresh parsley and serve immediately. Pairs very well with an Albarino. 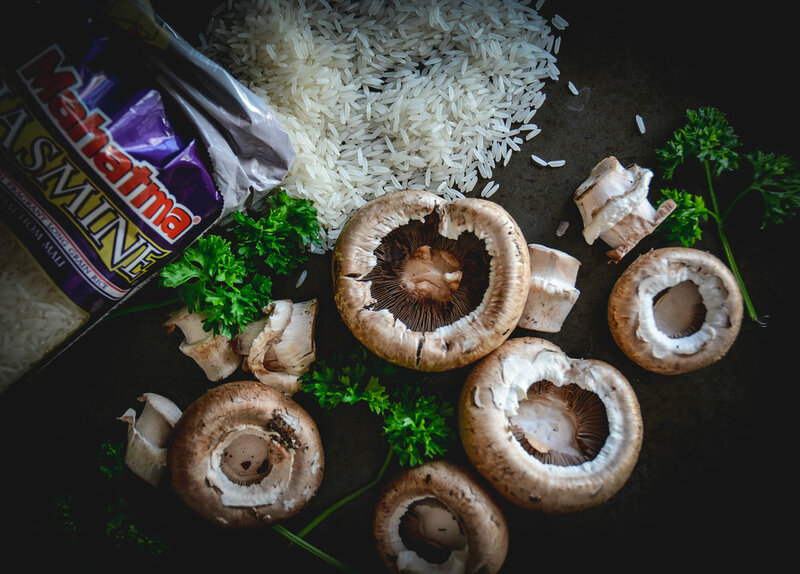 Mushrooms hold a certain mystery. Earthy, magical and delicious. In my younger years, my parents often took 2 vacations a year. It was the beach during the summer months and mountains in the fall. Since I have an utter obsession with water, the beach was always my preferred place. While it was packed with people, laughter and excitement exploding all around, the mountains offered the opposite. I viewed them as an enigma - intimidating and humbling. Our vacations generally involved a lot of hiking; long days filled with my searching for edible clover, drinking fresh water from tiny creeks and stopping to investigate every mushroom I spotted. Mushrooms fascinated me. I never was allowed to touch them. As relaxed as my parents were about things, that was the one thing they wouldn't budge on. And naturally, being told that I couldn't do something made me want it all the more. I would get on the ground, admire the shapes, the earthy colors, the drops of dew slowly making their way off the cap. My parents waited. They understood. Kids need the time to explore. But let's fast forward to today. I don't forage for mushrooms, though maybe some day I will. I pick them up at the farmers market or grocery store and sauté them with ghee and herbs. Today I wanted to try something a little different. An appetizer that's easy to make, with simple ingredients that are accessible to everyone. Whether you're hosting a March Madness party, making them for Easter or just entertaining friends and family, this is an easy one to throw together. I'm using one of my pantry staples and create this delicious appetizer that's sure to please a crowd. I've been using Mahatma rice for some time now. It's flavorful, versatile, delicious and affordable. You can check out Mahatma rice here. For this dish, I decided to infuse the rice with green tea, golden raisins and toss it together with a combination of sautéed shallots, reduced white wine and bacon and top it with some fresh parsley. 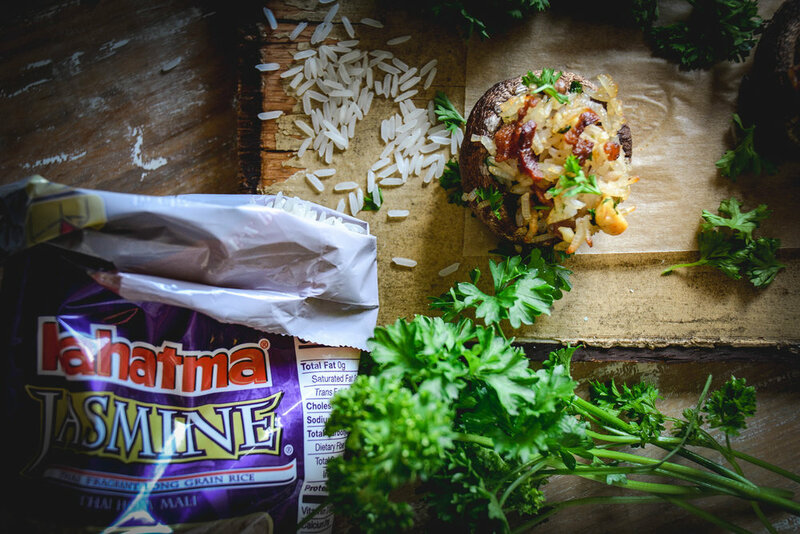 Then I take the mixture and stuff it in baby Portabella mushrooms and bake it for 15 minutes. An easy appetizer you can toss together even as your hungry guests arrive. Happy March everyone! In sauce pan combine rice, water, tea bag and raisins. Bring to a boil, remove tea bag, cover and turn heat down to a simmer. Cook for 15 minutes, turn off heat and let sit for 5 minutes. In frying pan, add bacon and cook for 5 minutes on medium heat, stirring continuously. Remove bacon pieces with slotted spoon and rest on paper towel lined plate, leaving bacon drippings in pan. Add shallots and pinch of salt and sauté on low heat for 5-7 minutes, stirring continuously, until shallots caramelize. Deglaze with wine and increase heat for 1-2 minutes until wine reduces. Turn off heat. Once rice is cooked, add to frying pan, along with walnuts, salt, pepper and 1 tbsp parsley. Add most of the bacon back in reserving a little to top mushrooms once they finish baking. Stir to combine. Place mushroom caps on parchment paper lined backing sheet and top with as much of the rice filling as you'd like. Bake for 15 minutes. 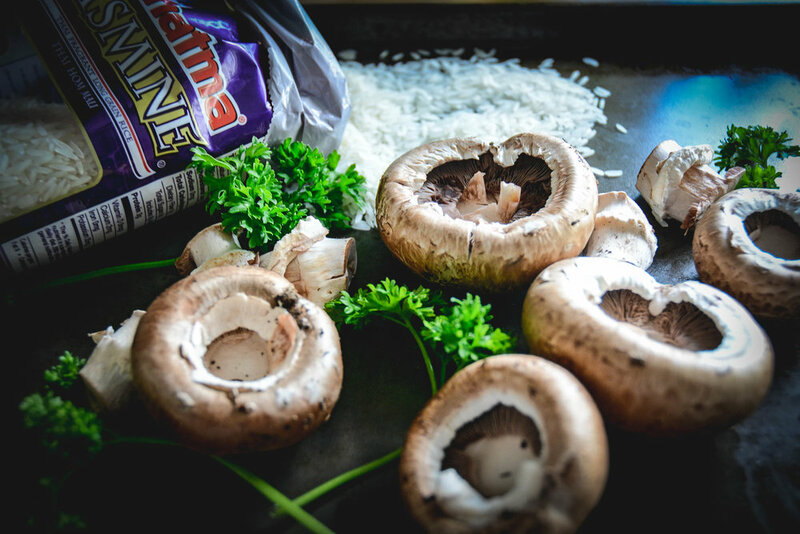 Once mushrooms are baked, top with leftover bacon and additional parsley.